Soli Deo Gloria! February 2nd, 2019 was full of God-glorifying performances as the LCS chorus had 47 students involved in 27 entries at District Solo & Ensemble. The Chorus participants earned 24 Superior ratings and 4 Excellent ratings and are simply grateful for the gifts and talents that God gave them. High School Superior ratings (whom qualify for State Solo & Ensemble in late March 2019) go to Soloists Julia Calvert, Hailey Caylor, Carter Chaplin, Dayne DeArmond, Carter Ferguson, Katie Jones, Brinley LaPorte, Colleen McVeigh and Adam Whyte. The High School Superior ratings for ensembles in the Chamber Ensemble category goes to Abby Branham, Julia Calvert, Hailey Caylor, Carter Chaplin, Dayne DeArmond, Carter Ferguson, Ama Fosu, Jace Gravitt, Christopher Lamb, Colleen McVeigh, Jamie Murray, Miolie Rock, Ethan Sale, JT Stacy, Lexy Thomas and Adam Whyte. The Men’s High School Ensemble also received a Superior rating. These students are Carter Chaplin, Dayne DeArmond, Carter Ferguson, Jace Gravitt, Christopher Lamb, Ethan Sale, JT Stacy and Adam Whyte. Superior rating for the High School Women’s Ensemble went to Abby Branham, Julia Calvert, Hailey Caylor, Morgan Cerekwicki, Ama Fosu, Bailey Hicks, Makayla Hill, Katie Jones, Alana Kicklighter, Eden Nuthalapaty, Miolie Rock, Carolina Rodriguez, Agnes Smith, Lexy Thomas and Samantha Thompson. High School Excellent ratings went to Soloists Eden Nuthalapaty and Brittany Riddle. For Middle School, Superior ratings went to Soloists Kylie Kirkman, Elizabeth Lott, Emma Parker, KJ Straub, Allison Sullivan and Taylor Vann. Middle school Superior ratings went to two duet teams; Ella Bell and Kylie Kirkman and duet Lillian Jacobs and Ella MacDonald. Middle School Quartet Superior ratings went to two quartet teams; Kylee Cress, Emilie Morin, Grace Pagliaro and KJ Straub. And the second quartet included Emily Gravitt, Tate Horne, Taylor Vann and Emmylou Varnum. 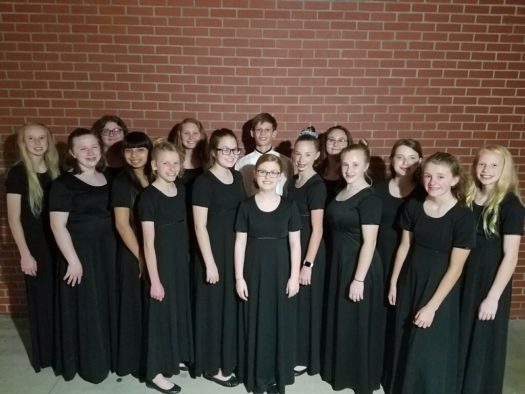 Superior ratings for Middle School Ensemble went to Jaiden Battaglia, Ella Bell, Kylee Cress, McKenna Gravitt, Kylie Kirkman, Emilie Morin, Katie Smith, Allison Sullivan and Kloe Young. And lastly, Middle School Excellent ratings went to Soloist Jaiden Battaglia and Gabriela Davis. Please congratulate and encourage these students for a job well done!